Frankfurt Professor Fred Brooks of Georgia State University shared with me a dense academic paper by Amanda Agan and Michael Makowsky, economics professors at the universities of Rutgers and Clemson respectively. The title of the paper was “Minimum Wage, EITC, and Criminal Recidivism,” which is not normally the kind of thing that comes into your email inbox and is greeted with an “Oh, boy!” Upon closer reading though, maybe that’s the wrong way to think about finding such a paper, because the professors did some heavy data lifting to allow them to postulate interestingly on the impact of raising the minimum wage, especially, whether it would reduce the incidence of former prisoners finding themselves back behind bars because of the what they term the “unemployment effect” and the calculation of the costs and benefits of working lower waged jobs versus the likely income from illegal activity. They looked at six-million records of prisoner release in more than a dozen states in a relatively short period up to 2014. They compared the release data with records of return and the impact of minimum wage increases in the same areas up to a maximum hourly wage at the time of $9.50 per hour. What they seem to have found is that the recidivism rate was a little under 3% less for every fifty-cent increase in the minimum wage in a locality for both men and women former prisoners. They found a significant decrease for women when there was an increase in Earned Income Tax Credits, though they could not find the same for men. All of that is very, very interesting. They hesitate to speculate on the policy impacts, but of course that’s not a problem for me. When they look at the different impacts of EITC for women they speculate that it has to do with the fact that many are single women heading households with children. They seem not to factor in the additional childcare credit that EITC provides households with children that might provide significantly more appreciable benefits to women in such situations that single men ex-prisoners trying to navigate the highly discriminatory job market for ex-cons. They don’t decry the impact of frozen minimum wages federally and in many of these states, but of course I can, since the marginal impact of a fifty-cent increase might yield much lower rates of recidivism in states where we won one-dollar an hour increases or, as they point out in the future, any areas where a significant improvement up to $15 an hour is achieved. They also don’t condemn the short-sightedness of conservative, Republican legislatures attempting to refuse to allow cities to increase minimum wages within their boundaries in Alabama, Florida, Louisiana, Texas and elsewhere even though proportionately the incident of prison population is more minority and more urban and the releases are also coming into cities. Allowed to have higher minimum wages, as many areas have approved at the ballot box, could drastically reduce crime rates as well as lower the percentages of those returning to jail. The mind boggles at the potential policy impacts that this study hints might be possible with fair wages and equitable wage distribution. Is anyone listening out there? New Orleans The following is my guest blog on the Working Class Perspectives site run by Professor Sherry Linkon of Georgetown and Professor John Russo, formerly of Youngstown State University in Ohio and now visiting scholar with the Kalmanovitz Initiative for Labor and Working Poor, also at Georgetown University in Washington, D.C. The federal minimum wage has been stuck at $7.25 per hour since 2009. Until last year, when the unemployment rate dropped almost to the level of full employment, wages were stagnant, exacerbating inequality. In 2018, average hourly earnings went up 3.15% and closed the year with a 3.9% jump. Even with those recent adjustments, workers still need a federal minimum increase. The Raise the Wage Act offers the prospect for change. The bill was introduced in May 2017 by Rep. Bobby Scott (D-VA), the ranking Democrat on the House Committee on Education and the Workforce, but it died in committee in 2018 with 170 co-sponsors, Democrats all. It proposed a dollar-a-year increase over seven years, eventually reaching $15.00 – more than twice the current minimum. It would also phase out lower pay for tip-credit workers who are currently frozen at $2.13 per hour as well as disabled worker exceptions. The Fight for $15 campaign, largely engineered and financed by the Service Employees International Union, has been a key force in defining $15.00 an hour as the goal. Their work has helped set eight states on the path to establishing minimum wages of between $12 and $15 per hour in coming years, including Arizona, California, Colorado, Maine, Massachusetts, Minnesota, New York, and Washington. Thirteen cities, including New York City, Seattle, and San Jose, are already at $15 or higher. While Fight for $15 has created momentum for the new Democratic House majority, today’s leaders should not forget the lessons learned from decades of living wage fights. On January 18, 1997, ACORN and Local 100, United Labor Unions (then affiliated with the SEIU), presented voters in Houston, Texas with what seemed a radical proposal at the time: a city ordinance to raise the minimum wage to the level of $6.50 per hour for all workers. Only months before, the federal minimum had finally risen from $4.25 per hour to $4.75. In a patronizing campaign against us, service industry and general business employers insisted that they understood our demand, but we were going about it the wrong way, and our proposal would cost jobs. While we won in lower-income and working-class districts, we lost the election 2 votes to 1. In River Oaks, the district where former President George H. Bush lived and voted, we garnered just one vote. Soon after, ACORN put a similar proposal before Denver voters, asking them to approve a minimum wage of $6.25. An expensive, blunt force campaign in the final two weeks by the hotel and restaurant association and fast food operators swamped us. Again, we lost two to one loss even as we swept black and brown, lower income, and working precincts throughout the city. We learned a key lesson from those losses: do the research. In Arizona, Michigan, Florida, and Ohio, we used polling to find out the rate that would gain support from at least 60% of voters. When we did that, even strident corporate campaigns didn’t block our way. Where we couldn’t do polling, we pegged the increase more modestly as a premium above the federal minimum, usually one dollar, which won in New Orleans, Missouri, and elsewhere. Once we learned to propose acceptable target rates, we won many more votes, and no living wage statewide proposition has lost at the ballot box in more than a dozen years. Between 1996 and 2008, we won more than 125 “living wage” campaigns around the country, delivering billions of dollars’ worth of raises to millions of workers. Where we won increases indexed to cost-of-living, like Florida, lower-waged workers continue to benefit. State and local minimum wage and living wage campaigns have continued in full force and fury. Approximately twenty states and twenty-three localities now have higher base hourly wage rates than the federal standard, and some 5.2 million workers began this year with a wage increase. Individual bumps in annual pay from $90 to $1300 add up to about $5.4 billion of increased income for workers. This is good news. But workers in twenty-nine states – about 2.2 million people — are still stuck at $7.25 per hour – or less! It’s time to make a deal. 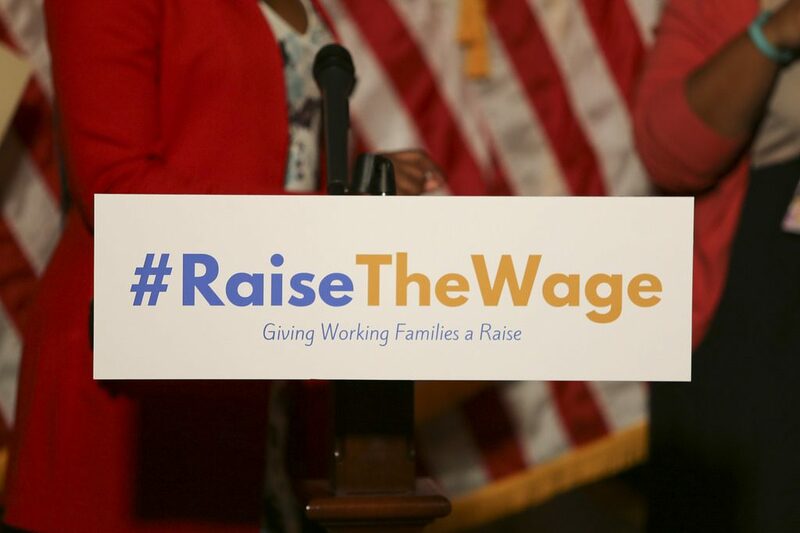 Reportedly, Democrats believe they now have enough votes to pass something like the Raise Wages Act and demand that the Senate either support, negotiate, or reject raising workers’ wages. We need to force politicians to finally deliver, whatever the intra-party polarization and squabbles. We also need to remember the lessons from the past. In Houston, Denver, and initially New Orleans, we lost support when we proposed raising the minimum 37% over the existing federal standard. To get to $15 on a fast track would be a jump of more than 100%, doubling the minimum wage. Pew Research found only 52% support for that big an increase. It’s just not likely to happen all at once. Even raising the minimum $1 per year is steep and unprecedented. The last ten-year freeze of the federal minimum, between 1997 and 2007, the raise was seventy cents annually for three years l. A dollar per year for seven years will be hard to win. But low wage workers need a deal, and at this point, just about any raise would do. Fifty more cents an hour for a full-time, 2080 hours a year worker is over $1000. Sure, a dollar would be even better, but any raise would be a godsend. This would be even better if we could finally win some form of automatic indexing for future increases and at least lift the cap on tipped workers’ wages. Both of those adjustments would be worth paying some real money to achieve at the negotiating table.